Hi everyone! 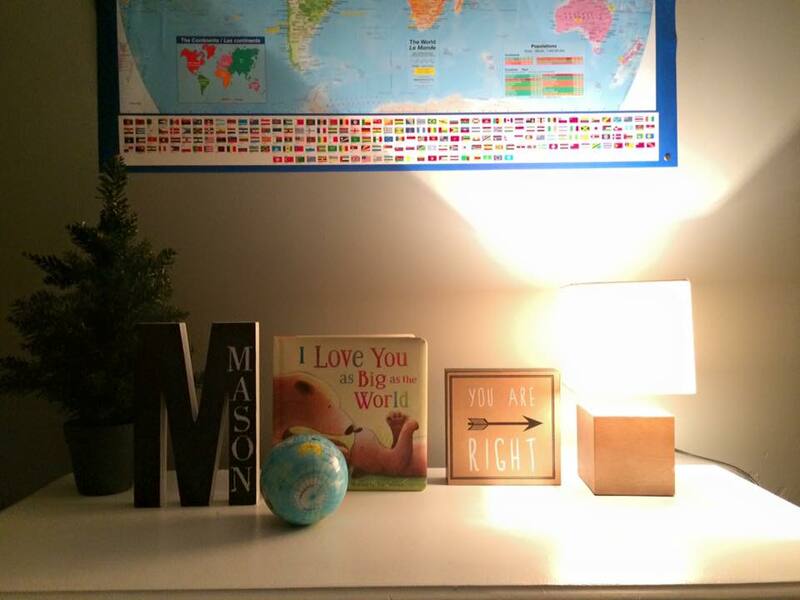 I've been wanting to re-do Mason's room for a while, and I finally did it yesterday! It only took me 1 day to complete, and it's exactly what I imagined it to be. First, let me explain why we wanted to re-do his room. In February, we moved into a 3 bedroom, 1.5 bath townhouse. Our townhouses get a budget each year for renovations, paint, ect. We ended up getting new flooring this year for our hallway and stairs, which was awesome. The previous tenants of our house had painted what is now Mason's room in a blue color with a dragon border, and since we do all the work ourselves, it was not painted over when they left. I was going to wait to get the paint budget, but I really wanted to get rid of that border and patchy blue walls. Every time I walked into his room, I felt like it wasn't his, and I'm sure the dragon border was fine for the previous tenant, but its not our style and it's not something that Mason is into, so it had to go. 1- He's only 20 months old. He barely watches TV at all- not even 1 show per day. Sometimes in the evening we will watch movies together, but he doesn't have a favorite show or favorite characters. Also, if he did have a favorite show, I'm not going to plaster characters all over the walls when he will just change his mind anyway. When he is older (you know, old enough to talk and tell me what he wants) I will absolutely decorate his room any way he wants, but at this age we wanted something more neutral that he can grow with. 2- We aren't fans of wearing characters on our clothes either (gasp) because I do not see the point in revolving his life around shows he does not watch or will get bored of soon. When I was growing up, we never had bedrooms based on TV shows and my mom always made sure we had the most awesome rooms. He has toys that are based on some TV shows (Paw Patrol, Mickey Mouse, ect) because he enjoys it now. Toys are a lot easier to swap and change than a whole room is when he does get bored of it. I absolutely support other parent's decorating their toddler's rooms however they decide to, whether it be with characters or anything else, so I don't understand why anyone would care how we choose to decorate Mason's room. 3- It was important to me that he had a room that encouraged play and learning. He has lots of toys, books and interesting things to look at. It is not a boring room at all. I wanted him to walk into his room and feel a sense of calm and relaxation, which is why I was SO happy to get this paint color from a friend of mine. It's the most perfect calming grey color (I'll talk more about it in my next post). 4- Mason loves being outdoors, and going on adventures. He loves going camping, being at the ocean, going for walks, playing outside, and just being a little adventurer. 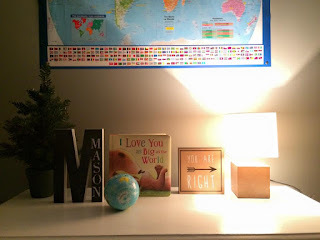 I definitely wanted to bring a sense of travel and adventure into his room. When I was pregnant with him, I always used to say that I wanted to give him a life of love and adventure (hence the name of my blog). Travel and being outdoors is so important to me, and I wanted to bring a little piece of that into his bedroom. Since he loves camping so much, the original theme of the room was just camping and the outdoors, but after finding so many cute travel related items, I decided to incorporate those too. I still have a couple of camping related items left to order that go along with his play tent. Again, there is nothing boring about his room. 5- My last point is probably the most important to me. I am not re-decorating my son's room to "show off" or get attention in any way. I would not spend hours and hours painting by myself (with a shoulder injury that causes my shoulder to dislocate when my arm is stretched out), moving furniture around, standing on chairs to hang pictures and tape the ceiling. I would not spend all of this time, effort and money just to post a photo to "show off". That is absolutely ridiculous, and I don't know any parent that would do that. I re-did his room because it needed to be done, I wanted to do that for him, and the look of excitement on his face when he saw it, and him running around saying "whoa!" was exactly what I was hoping for. He loves his new room, and that makes me SO happy to know that I could create a beautiful, functional room that he can enjoy. Also, there are no "lame" Christmases at our house. His bedroom was not his only gift (although any child should be happy to have their room re-done). He still has a lot of fun toys, games and new clothes to open from us, as well as everything the grandparents are getting him.